All stamps need a little extra love and care occasionally and while yes, our stamps are made exclusively with only the very best parts and materials, the time will eventually come where your stamp will need some new ink. Please keep in mind this does not mean the end of your stamp! 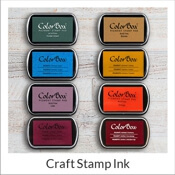 All you will need to do is purchase a new bottle of ink specifically made for your stamp brand and your stamp will be good as new and leaving you crisp and clear impressions every time! 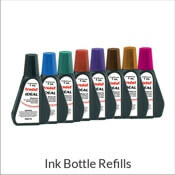 Order a refill bottle of stamper ink today! 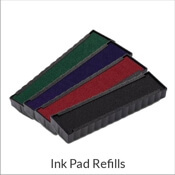 Bring your ink pad back to life with a few drops of ink. Explore Ultimark inking fluid and Trodat Ideal colors. 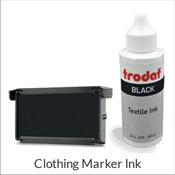 Find clothing ink for DIY projects as well. Ink bottle range in size, from 1/2 oz to 4 oz. Not sure how to refill your self-inking stamp? Visit our Video Resource Center to learn about your stamp model. We have videos on how to refill self-inking stamps and pre-inked stamps. We have many to choose from, each corresponding to a particular stamp model.